J. Palisa discovered asteroids #262 Valda and #263 Dresda. A. Kopff discovered asteroid #579 Sidonia; M. Wolf discovered asteroid #2533. The Soviet Union launched Sputnik 2 carrying a dog named Laika, the first orbital satellite to carry a living animal. NASA launched Explorer 8 from Cape Canaveral, Florida, for ionospheric research. Explorer 8, launched 3 November 1960, was a 41 kg mercury battery powered Earth orbiting satellite designed to obtain measurements of the electron density, the electron temperature, the ion concentration, the ion mass, the micrometeorite distribution, and the micrometeorite mass in the ionosphere at altitudes between 400 and 1600 km. It studied the temporal and spatial distribution of these properties and their variation from full sunlit conditions to full shadow (nighttime) conditions. The payload was in the form of two truncated cones with their bases attached to a cylindrical equator. The outer shell was aluminum, 76 cm in diameter and 76 cm tall. The 108.00 MHz transmitter broadcast at 100 mW average power, and it functioned for the life of the battery pack (54 days). Solar cells were not used to power the satellite to avoid the possibility of effects on the experiments by asymmetrical charging on solar cell surfaces. The data system included telemetry consisting of continuous operation with real-time transmission. Experiment instrumentation included an RF impedance probe, an ion current monitor, a retarding potential probe, a two-element and a three-element electron temperature probe, an electron current monitor, a photomultiplier-type and a microphone-type micrometeorite detector, an electric field meter, a solar horizon sensor, and thermistor temperature probes. Simultaneous measurements of electron and ion concentration were used to resolve the question of neutrality of the medium. Battery power failed on 27 December 1960. Considerable difficulty was encountered with decommutating the telemetered data to make machine processing possible. As a result, the data were mostly processed by hand. In spite of the difficulties, considerable new knowledge about the ionosphere was gained from operation of the satellite. Valentina Tereshkova (Vostok 6, the first woman into space space) married cosmonaut Andrian Nikolayev (Vostok 3). 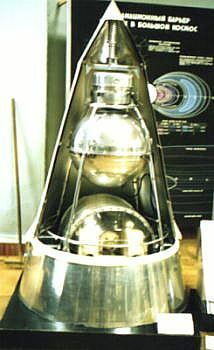 Vostok 6 was launched on 16 June 1963, with Valentina Tereshkova, the first woman in space, on board. Valentina returned to Earth on 19 June 1963. At the time, the Soviet space program had one eligible bachelor, Andrian Nikolayev, who had flown aboard Vostok 3 on 11 August 1962. Rumors began that Valentina and Andrian were an item. Although they were untrue, the rumors eventually reached the ear of Premier Nikita Khrushchev who thought such a union would be a wonderful and novel thing. He turned on the pressure and Valentina and Andrian were wed on 3 November 1963, in a ceremony at the Moscow Wedding Palace with Khrushchev presiding. Valentina's marriage to Andrian did not last long, but it did last long enough for the couple to have one child: Seven months after the wedding, on 8 June 1964, Valentina gave birth to their only child, a daughter named Elena Andrionovna, who grew up to become a doctor. Goethe Link Observatory discovered asteroid #2351 O'Higgins. NASA/USAF launched X-15A-2 External Tank Test mission # 155, the first flight with empty external tanks, in which Robert Rushworth reached maximums of 2414 kph (Mach 2.31) and 21.519 km altitude. The ammonia tank was recovered, the LOx tank was destroyed. The US Air Force launched a Titan 3C from Cape Canaveral, Florida, carrying a Manned Orbiting Laboratory (MOL) mockup and the Gemini B spacecraft, as well as four technology satellites that were put into orbit. On 3 November 1966, the US Air Force launched a Manned Orbtiing Laboratory (MOL) mockup as part of a flight which lofted the unmanned modified Gemini B capsule on a suborbital trajectory, and carried four satellites into orbit. The modified Titan 2 propellant tank represented the MOL station itself. It allowed study of the aerodynamic loads associated with launching the MOL into orbit, and validated the very long length to diameter core represented by the MOL/Titan 3M configuration. It is possible certain prototype MOL equipment was flown as well. During the ascent to orbit, the Gemini capsule atop the MOL Cannister was ejected and made a suborbital reentry and splashdown in the Atlantic Ocean. The spacecraft was the Gemini 2 reentry module, reused to test reentry with a hatch cut into the heat shield. The capsule was successfully recovered, and it was found that the reentry actually melted the hatch shut, indicating that the design was valid for the MOL. Launched into orbit on the flight were the OV4-03, OV1-06S, OV4-01R and OV4-01T technology satellites, the latter two announced as "whispering gallery" experiments. 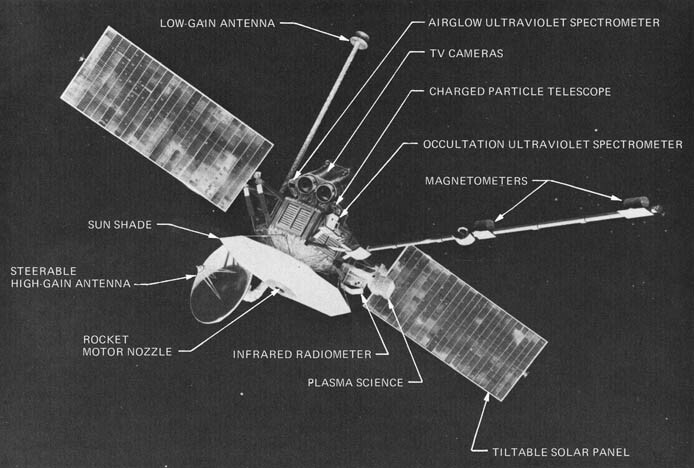 NASA launched Mariner 10 toward Mercury, via Venus. P. Wild discovered asteroid #2151 Hadwiger; Purple Mountain Observatory discovered asteroids #2255 Qinghai and #2693 Yan'an. Purple Mountain Observatory discovered asteroids #3206 and #3609; Z. Knezevic discovered asteroid #3176 Paolicchi. D. J. Tholen discovered asteroid #3124 Kansas; F. Borngen and K. Kirsch discovered asteroids #2861 Lambrecht and #3499 Hoppe. During the 2h 55m Salyut 7 EO-2-2 EVA, cosmonauts Lyakhov and Aleksandrov completed installation of the auxiliary solar array. USSR launched Gorizont 21 from Baikonur for telephone and telegraph communications and transmission of television programs, positioned in geosynchronous orbit at 90 deg E 1990-1993; at 145 deg E 1993-1999 after being replaced by Gorizont 28. A total solar eclipse occurred, visible over South America and the south Atlantic Ocean (4 minutes 23 seconds). Dutch and British astronomers announced they had discovered the nearby spiral nebula Dwingeloo 1, hidden behind the Milky Way. NASA launched STS 66 (Atlantis 13, Shuttle 66) carrying ATLAS-3 and CRISTA-SPAS experiments to space. During the 6h 4m Mir EO-24-4 EVA, Mir cosmonauts Solovyov and Vinogradov removed a solar array from the Kvant module, and hand-launched the Sputnik 40 1/3 scale model of Sputnik 1. The Spartan 201 satellite was retrieved by STS 95 (Discovery 25) from its fifth mission to observe the solar corona. The mission data was used to recalibrate the SOHO satellite which had recently resumed observation of the Sun following loss of control.